Want to convert MOV to iPhone for a road trip? Have problems with converting MOV files to iPhone? MOV is a container, and MOV files from different source have many different codec inside. However iPhone can only play certain codec that it supports. So some MOV videos can't be played or image quality is poor in iPhone because of the incompatible video formats. 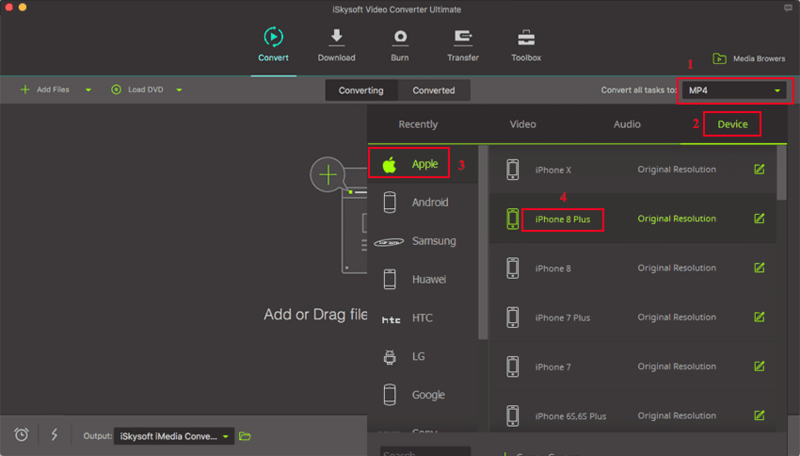 iSkysoft Video Converter Ultimate as the name suggests is one of the fastest video converters in the industry and does so without losing quality. However, you may need to convert your QuickTime MOV files, which are very large, into formats that can be played on an iPhone. Convert MOV to iPhone on Mac with Zero Quality Loss. Converts 150+ Video Formats – Whether you are converting HD or standard quality videos, this tool will work well with almost all types of video formats. Lossless Conversion – Support to convert all the videos with H.264 encoder with no quality loss at 90X faster speed than other video converters. Customize Video Performance – Before you convert your QuickTime movie, you can edit it by Trim, Crop, Rotate, add Effects, Watermark, etc. 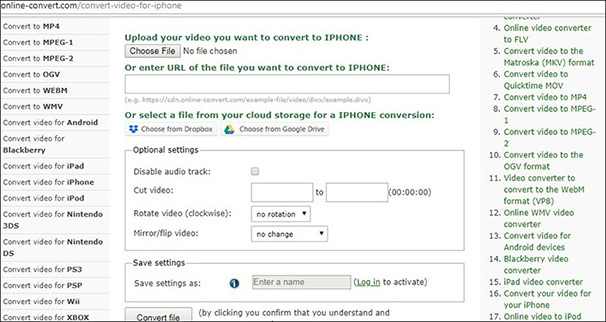 Transfer to iPhone/Tablets – Quickly convert the video to mobile device format and then transfer to your iPhone with USB cable connected. Convert Online Videos – Download online videos from 1000+ video streaming sites, like YouTube, VEVO, Vimeo, Dailymotion, Facebook and so on. Burn DVD – Burn MOV/QuickTime videos to blank DVD as backup for home use when you need. Click the "Add Files" on top left of the main window to load MOV files into the converter window. You can also drag and drop the files into the window for fast operation. This MOV to iPhone converter also supports to directly import videos from your mobile devices like iPhone to the converter, for this just click the drop down icon beside to find the option. Go to the output format tray and then select iPhone from Device tab as your final output. You will then be presented with the iPhone video formats and you can select that which you want. MP4 is usually the best format. Click on the “Convert” button in each video clip or "Convert All" button to start the conversion process from QuickTime MOV to iPhone. What's more, you can go to the "Preferences" option then click "Convert" to choose "Automatically add files to iTunes Library after conversion", so that you can easily transfer MOV videos to your iPhone (X/8/8 Plus/7/7 Plus/6s). Zamzar is an online tool that is a good source to convert MOV to iPhone format. It also supports around 1000 formats for conversion, which includes videos, images, files, documents, songs etc. 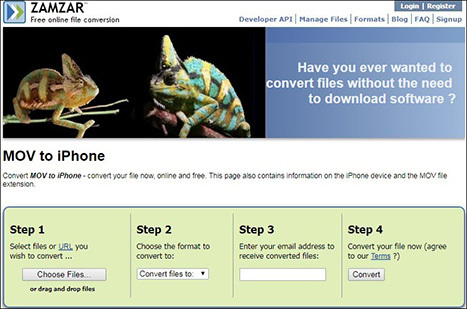 It is one of the best MOV to iPhone converter that offers free access to their website. • Convert MOV to iPhone format directly and email as a safety measure. • You are provided with video downloading facility (from YouTube) in addition to conversion. • Easy to use interface with simple steps. • For free users, the conversion process is lengthy. • Bulk conversion not allowed. Filezigzag is a file storage and conversion supported website with which you can easily convert MOV to iPhone for free. Besides video, you can also convert audio, images or document files in a quite easy manner. 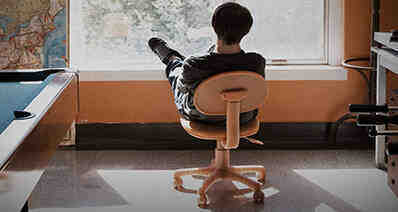 • Provides a free interface that is accessible from any system. • Unlimited file conversion is allowed. • You can upload the file from Google drive or through a URL too. • Only one file at a time can get converted. • Per day limit is 180 MB. • You cannot upload a file greater than 2GB size. If your concern is to get a free MOV to iPhone converter then Online-Convert.com is the name you can consider due to its myriad of services. Conversion such as from MOV to iPhone is not the only thing you can go with, well it also offers audio, ebook, image, document, hash, archive conversion facility. • Multiple files can be selected at a time for conversion. • You can convert up to 100 MB data only. • As per user reviews, it tries to have control over your files or Google drive by redirecting them to a website.